Rusty Goes to London is a throwback of Ruskin Bond’s yesteryear, highlighting his dream to become a writer at a very young age. So, through this book Ruskin (as goes Rusty) tried to explain the kind of struggle he had to become an established writer. Rusty, a boy from the hills of Dehradun, wants to be a very good writer and also wishes that his book should be sold abroad. Thus, he sets on a journey to reach London. Upon reaching there, he takes up a clerk’s job and manages to pen down a novel. Much to his amazement, he finds a publisher but fails to achieve the anticipated success he had in his mind. While staying there he experiences various thrilling activities and meets the greats like Sherlock Homes and Rudyard Kipling. In the end, he returns to India to write books all his life and leaves the world’s glamour which does not suit him. 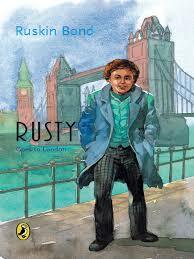 Rusty Goes to London by Ruskin Bond is an agreeable read to Mr. Bond’s young readers. This book is the fourth in the Puffin’s new series. Rusty, the protagonist, is an interesting lad. The events in the book are well placed according to the themes and circumstances. The language is simple and good; therefore, he is famous among kids, teenagers, school teachers and parents. Though the plot of the book is common but motivating enough for the children with malleable hearts.